My parents taught me as a child that Jesus Christ is the only way, the Truth and the life and no man comes to the father, but by Him. How grateful I am for that teaching. As an 8 year old I trusted Christ as Savior and although I have not always lived as I should, Jesus never left me and He kept working on me and He still does today! He has allowed me to see all my children trust Him as Savior and go on living for Him and teaching their own children about the Lord. What a privilege to now be a grandparent and continue instilling the truths of God’s Word in the generations to come. 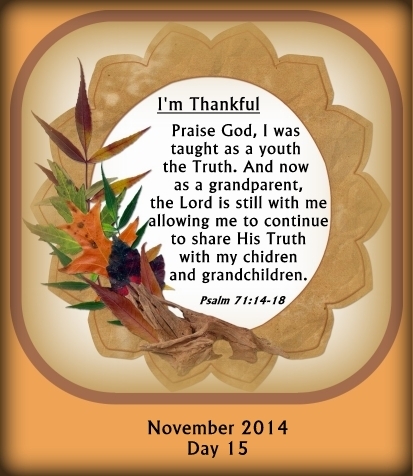 As a Christian are you passing the Truths of God’s Word onto your children and grandchildren?